This article in Sunday’s Chicago Tribune jumped out at me. “Do Your Books Spark Joy?” Is that a trick question? 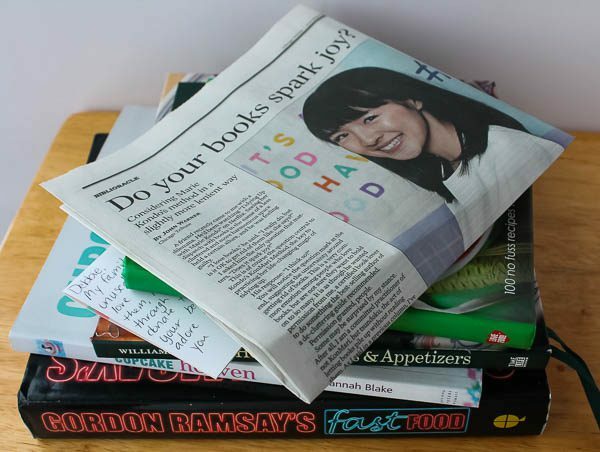 For those not familiar with Marie Kondo, pictured in the article, she is the popular author of books and star of a Netflix series about tidying up and organizing personal items. She believes that if something does not spark joy in your soul, throw it away. Many people have followed Kondo’s methods and were able to toss clothes, furniture, kitchen items, make-up, and about a million other things to have a more organized life, mind, and spirit to live one’s best life. I read Kondo’s book over a year ago and followed her methods, but haven’t yet gone beyond my closet and drawers. I enjoyed the book and still have those areas organized. Next will be my kitchen pantry, which I’m sure would horrify Kondo. 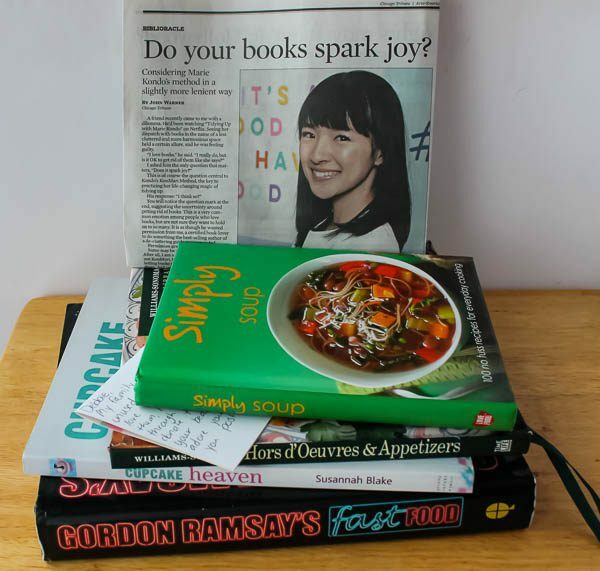 Kondo does mention books and how to organize a personal library, but her question always remains the same no matter what the objects: “Do they spark joy?” My answer when it comes to my cookbook library is a resounding, Yes! I imagine if Kondo were here and viewing my library, she would ask, “Do they all bring joy, all a couple thousand of them?” My answer would still be, Yes. The reason why my answer would always be yes is that every one of the cookbooks sparks joy. This is because every one of them was a gift from someone special; some from family and friends, but most were from generous strangers. When a seven-foot wall of water and mud washed away my original library of thousands of cookbooks and recipes lovingly collected over almost fifty years, I was devastated. What brought me out of the nightmare that broke my heart and cost tens of thousands of dollars to clean up, was the kindness of strangers. There is something wonderful about those who love to cook and collect cookbooks. When something happens to someone else that would also be their own nightmare, they reach out to help. For months and months, every single day, I would find boxes and boxes of cookbooks delivered to my front porch. Two incredible women even gave me their entire collections of hundreds of books which required either a U-Haul or large pick-up truck to bring them to my home. When I look at my shelves now, filled with donated books, it sparks more joy than I can say. They were gifts from the heart, and I think even Kondo herself would understand. Books still arrive on a regular basis; not every day as it was at first, but cookbook enthusiasts still find my blog and want to help rebuild the library. These are some of the books I just received the other day, when our temperature was an arctic level of 50 below zero wind chill. A woman named Justina from Minnesota found my blog, read about the flood, and wanted to send books. Justina wrote in her enclosed note that her family enjoys gifting her with their unused cookbooks. While she enjoys and appreciates them, she didn’t think it would be possible to cook through them all and decided to send some to me instead. I can tell you that just the sight of her box on my snow-covered front porch sparked joy. It was one more box from one more generous person. Thank you, Justina, for the great cookbooks and for your heartfelt note which will always be kept in one of the books that sparks joy. And to Marie Kondo, I wish you were here to help me with my pantry. I will have a hard time tossing out those obscure spices. 8 Responses to Do Your Books Spark Joy? I have never read Marie Kondo’s book–but my New Year’s resolution every other year (would be too hard to do every year) is to clean out one drawer, closer, cabinet a day until they are all organized and in order. What you don’t realize is how many drawers and cabinets you have ! But I will say there is a joy when you open a drawer or cabinet and realize it’s clean. I’m sure you get the same sort of joy when you go to your basement and see a book that someone sent you–you get that wonderful warm feeling. I am still keeping up with my resolution–haven’t done it every day–but will get it done by May–lol! Barb, my “tidying up” Kondo style is an ongoing process, but I like it. It is a comforting accomplishment to open drawers and closets that are all neat and arranged. Good luck with yours too. I think you will beat me if you get done by May! I’m way behind now ! Gotta get back on track–maybe tackle a drawer that I know will be a quick clean and then work up from there. That’s how I work it too, Barb. I can’t do it all at once! I found your blog this month and I LOVE it! too am a cookbook collector, mostly of baking books, but they all bring me great joy. This weekend I made a trip to my favorite source of used books in CT and loaded up! I’ve been studying them and picking out recipes, including one called “Chicken Souvlaki”. Hi Michelle- I’m happy you found me too! I love hearing from fellow cookbook collectors, and where you find them. Used book stores are a great source. I always find something at them. I’d love to hear how your Chicken Souvlaki turned out. Thanks so much for writing! I’d love to contribute to your culinary cellar! Let me know. Thank you for the kind offer, Michelle! I’ll send you an email!